Ireland’s biggest bookmaker was founded in 1988 by the merger of the several dozens of shops of three Irish bookmakers, which pooled their talents together. Since that time it has been one of the most successful and innovative bookie in the world. 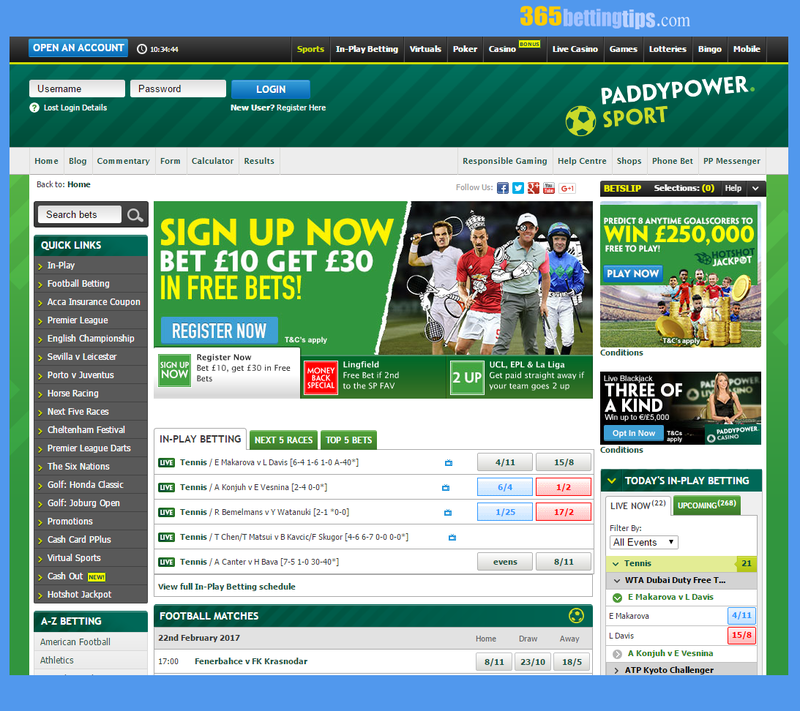 Paddy Power holds a license in most countries around the globe and is the third largest online bookmaker today. Its revenue is about €900 million per year. Besides, Paddy Power is licensed by the Isle of Man and by the UK Gambling Commission for casino and poker. Being one of the largest bookmakers on the market Paddy Power operates a big chain of retail outlets – more than 200 in Ireland and Northern Ireland and about 140 in Great Britain. The company is listed on the Irish Stock and London Stock Exchanges. The Irish bookie has largely been expanded into the Europe betting landscape over the past decade; Paddy Power has appeared online since 2005. An Irish bookmaker has always been recognizable and slightly controversial brand in the betting industry. It very often conducts ethically questionable marketing campaigns and use eye-catching commercials. Its marketing actions have allowed them to win new customers over the years, but have drawn a lot of criticism. For instance, Paddy Power offers such markets as a potential extinction of the polar bear or an assassination of Barack Obama! Paddy Power's ads have also been criticized: one of them featured a scene when footballers were kicking a cat. One more spectacular example of Paddy Power’s betting style is a pay out over $1 million on 18 October 2016 to punters who bet on Hillary Clinton in the US presidential election. On the next day Trump was officially declared the winner of the presidential election … That's the way it is with Paddy Power! This bookmaker has always been famed for offering novelty style bets. In 2015 Paddy Power Betfair was found by the merger of Paddy Power (52%) and Betfair (48%). A new business maintains separate brands. Paddy Power owns several other bookmakers (Sportsbet and IAS) and also has a partnership with French bookmaker PMU. Paddy Power is not a typical bookie, but don’t worry this bookmaker provides solid services with full range of markets and live betting, great welcome bonus and most competitive odds. Of course you can always find here odds on bizarre markets that other bookies simply don’t have. Besides, the Irish bookmaker offers many promotions, like daily enhanced trebles, which make it stand out from the crowd. “Money-back special” is one of the most distinctive features of Paddy Power. This bookie is truly the best when it comes to money back specials! It’s an Irish bookmaker so don’t be surprised to see all shades of green and maybe even feel a little green yourself! The website design is a throwback to the Irish roots. The site is very quick to load and easy on the eye. The bookmaker has an excellent gambling software and website’s functionality is probably the best online. The site is available only in English and Spanish, but Paddy Power is planning to add other languages in the near future. The home page is not too crowded and has excellent functionality so you do not have to search anything. A traditional left-hand menu at the homepage gives you everything you need! There is a Quick Links section which is really unique and wisely created! It simplifies the search process for you. There are fast links for in-play, football betting, acca insurance coupon, horse racing, next five races, top leagues and hot today’s sports events, promotions and many more - everything is at hand! But if you can’t find what you need at once there is also a handy 'Search Bets' facility. The ‘A-Z sport menu’ as well as ‘site settings’ and ‘help & contact’ sections are on the left side. Many betting events are displayed in the middle of the homepage, giving you a quick access to today’s top matches in each sport. You can also see the list of live in-play betting events, top 5 bets of a day and of course the latest offers. In the right-hand menu below the item 'Bet-slip' you will find today’s in-play betting list (live now and upcoming), which you can filter by sports. The section with most popular bets of the day is available. Paddy Power offers numerous odds formats on its website. Placing a bet is a very quick and easy procedure; live betting section is also easy-to-use, odds are updated rapidly, live streaming is available (but you must be logged into your account). Most of customers will probably like a useful function ‘My Team’ which allows selecting a team and getting all the odds with a click of a button. Besides you can use ‘Cash Out’ option which gives you control over bets and allows you to take a return from selected bets before an event has finished. You can see how to use ‘Cash Out’ option in this video. As you would expect from Paddy Power football betting menu is unusual but very handy. It includes such categories as football matches; football coupons, football specials, football outrights and football team page, where you can find all markets and odds, some useful information, team news, resent results, head-to-head and other statistic. In the football betting section you can choose not only a league or tournament, but also get a quick access to every markets like draw no bet or Asian handicap; you can get the list of today’s or tomorrow’s matches. ‘Blog’ with entertaining and informative content (football and horse racing news, betting tips, top stories of a day, columnists section) is one more amazing feature from Paddy Power. ‘Paddy Power inFormer’ with information of horse or jockey form could also be useful for betting. There are many other extras, including bet calculator and audio commentary. Paddy Power has a very well developed payment section with plenty of options. Customers can deposit or withdraw using all standard and popular methods. Perhaps a short list of currencies is the major drawback of this bookmaker; you can choose only EURO or GBP. It looks a little bit strange… But as for the rest the company delivers high standards. All depositing systems are very fast or immediately processed; you can choose from slower methods like bank transfers or cheque to instant methods like e-wallets or cards. One way or another you will always have a possibility to start betting in several minutes. Note that some sign up bonuses can’t be available due to deposit payment methods. We recommend e-wallet or card as you can never go wrong with these payment methods. Also it would be rational to use the same withdrawal methods you used when depositing funds to your account, it’s convenient and secure. Paddy Power has the same minimal deposit for all methods £/€10, but processing times depend on the method you use. Deposit methods available immediately include: PayPal, Laser, Neteller, Solo, Skrill, Visa, Visa Electron and Mastercard. All these methods are free of charge. Bank transfer and cheque transaction time is 1-5 working days, but depends on the individual case, as for cheque, for instance, it could be up to 10 working days. Maximum deposit to Paddy Power is £/€8 000 with the exception of PayPal and Laser (max deposit is not regulated). Withdrawals can be made using one of the following methods: PayPal, Laser, Neteller, Solo, Skrill and all major credit or debit cards. Minimum withdrawal from Paddy Power is £/€10, maximum withdrawal is £/€2 500 with the exception of PayPal (£/€2 000). Processing time for e-wallets is up to 24 hours, but usually it takes a little time. Transaction time for bank transfer, cheque and cards is 3-5 days. Please remember you must complete the verification procedure before a withdrawal request. First off all you must confirm that you are over 18 years old. Just take a copy of your passport photo or driver’s license or your utility bill and send to Paddy Power. It’s important for your current address to match up with the billing address or your account will be suspended! You must send all photos in a good quality; name and address should be clearly visible. Payment methods on your account should be registered in your name. For example if it’s a credit card, you must send photo of your card and don’t forget to cover the first 12 digits on the card, leaving the last 4. Please note that you should not send the photo of the back of your card with CVV code. You can always change a payment method on Paddy Power, but only in case your balance (inclusive of open bets) is less than £/€50. So in some cases you must first withdraw the part of your balance to have the opportunity to change a payment method. This rule does not apply to cheque or bank transfer methods; you can always withdraw your funds without changing. All this seems a little bit complicated, but it is only for your safety. Paddy Power is a great place to get all of your betting needs. Most bookmakers cover many leagues around the world, some of them have a huge range of markets, but no one else can be compared with Paddy Power when it comes to sports coverage! There are no sports in the world that Paddy Power couldn’t offer. This is one of Paddy Power's strongest sides. The bookmaker provides odds on almost all sports. You can be sure that you will find at least a few betting markets even on such exotic sports such as Sumo Wrestling or Cliff Diving. You really can bet on everything with this Irish bookie as it offers markets on 50 different sports. Paddy Power provides American football, baseball, basketball, cricket, darts, football, golf, greyhounds, horse racing, ice hockey, tennis, volleyball and that's not even the half of the list, you can also find such sports as beach volleyball, cycling, rugby league, triathlon, badminton, gymnastics, judo, show jumping, and even fishing! In addition to the traditional markets there are also markets for politics, lotteries and TV shows. You can find interesting financial betting here, and of course if you like to bet on specials there are events which are not available elsewhere except for Paddy Power. One of Paddy Power’s strength is its ability to offer markets from a wide range of leagues around the globe. For example it provides about 150 different lines for a top football match and no less than 80 markets for minor leagues. You will always be able to find the necessary market on Paddy Power website. Due to its creative nature Paddy Power is always ready to offer some unique markets. It should be noted that this bookie is a little bit more British and has a focus on Irish sports, football and horse racing. If football is your game Paddy Power is your bookie! You can find all types of bets divided into the following categories: Win Markets (match betting, result & both to score, draw no bet, double chance, half time/full time, to win to nil, win& over, to score first and fail to win, etc. ); Correct Score Markets; Goalscorer Markets (first, last or anytime goalscorer, to score 2 or more, first to score for their team, to score a hat-trick); Scorecast & Wincast; Goal Markets (a goal scored in both halves, time of first or first team goal, total goals in match, total goals odd or even, to score a penalty, team to score); Total Goals Markets (over/under, first half over/under, team first half goals, number of goals, etc. ); Markets Handicap (including Asian handicap); 1st Half Markets. 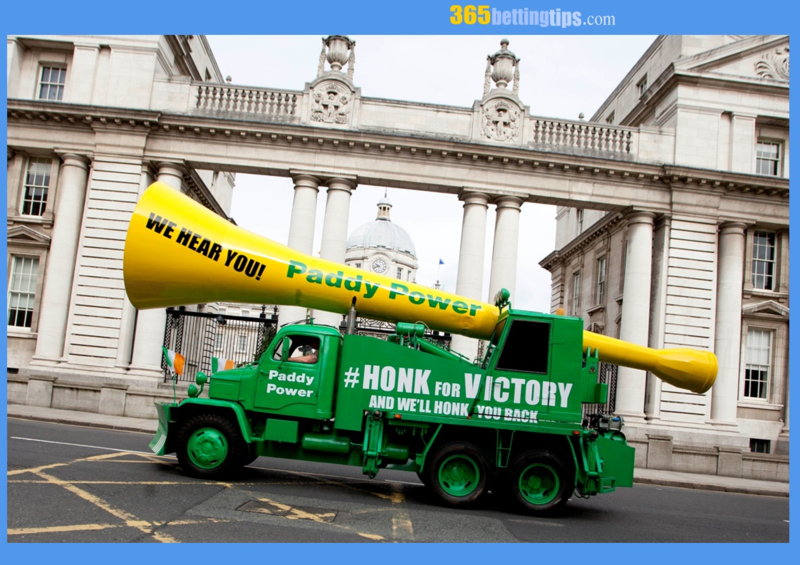 Paddy Power is famous for its promotions; the company provides a massive range of special offers and coupons. And it’s not a surprise as an Irish bookmaker has pioneered money back specials, free bets, daily enhanced football offers and cash back! Paddy Power is definitely the best in regards to ‘money back specials’ which refund all losing bets as free bets. The bookmaker offers around five ‘money back specials’ weekly and you can view the archive of specials to see which of them were paid out. Besides you can enjoy The Hotshot Jackpot which is absolutely free to play where you need to pick 8 anytime goalscorers in 8 different games and win £250 000. Many offers are also available on this website, such as Acca Insurance (you can get money back as a free bet if five or more team accumulator is let down by just one) or Horse Racing Guaranteed Prices, Enhanced odds promotions, etc. As the third largest online operator Paddy Power is one of the most competitive bookmakers when it comes to odds. An Irish bookie offers generous odds which are the highest on the market. Overall betting margin is around 4.6%, i.e. one of the lowest online. The highest profit margin is on tennis 5.5%, the lowest on American sports – average 4.2%, as for other sports it gives a good value for punters. Betting margin is equal to 4.7% for football, 4.4% for ice hockey and basketball. It’s no wonder that Paddy Power as one of the leaders on the market provides a great gambling range. If you prefer something other than sports betting an Irish bookie can propose slots, roulette, blackjack, jackpots, card & table, video poker, scratch and live dealers. Software is provided by Playtech and IGT. Welcome bonus is given to all new customers! Being among the leaders in the gambling industry Paddy Power offers one of the best in-play betting sections with a comprehensive live streaming service. A simple and lightweight in-play betting page is updated automatically, there is no need to refresh it; the odds are flashing red or blue depending on whether prices are shortening or lengthening. Most popular sports events are always shown on the main page, other events can be easily found on the start menu. You can place a single bet or accumulator on a pre-match. 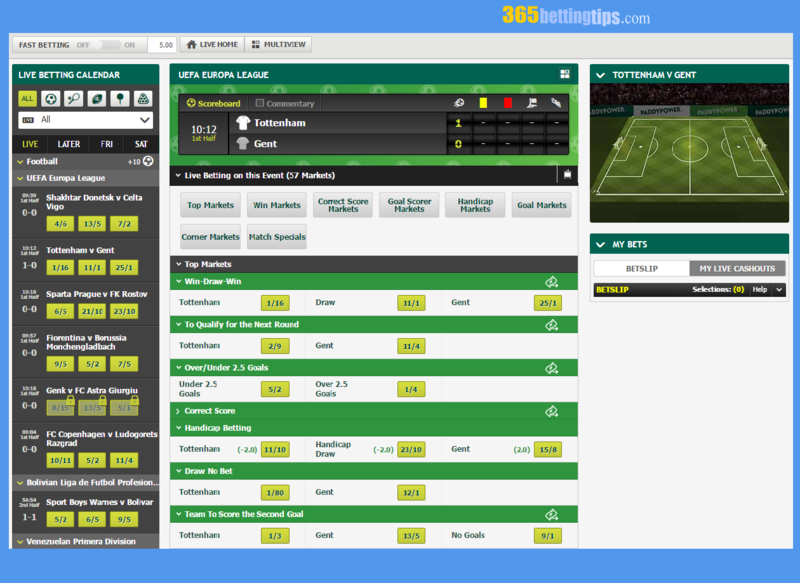 Live betting console interface is rather functional and simple; statistics is available. Unfortunately infographic is worse and less informative in comparison to other top bookies. Paddy Power has a very handy live betting calendar with many options. You can choose between sports and check which events will be available to stream live. There is a schedule with current events, list of events for the rest of a day and for the next two days. All events are indicated with icons so you know whether they will stream live. Paddy Power offers an amazing number of markets. There could be hundred of events at the same time starting from popular football matches to some exotic competitions. Paddy Power live section is really the product which is very well done providing competitive odds for a wide range of sports and over 80 in-play markets for the one game. It is difficult to follow many matches at the same time but don’t worry Paddy Power will take care of this problem! There is the ‘multiview’ function which gives you the possibility to drag any event from the left menu and drop it to the central live section, so you can check a few matches on the screen. If some events are not available for live streaming you can get audio or text commentaries which may be helpful for your live betting. The Paddy Power live streaming service is one of the best features on the website. It is very simple to get an access, you must be logged in and have credit in your account, then just click on the tab ‘Watch Live’. All events are free to watch, but for horse racing you must place the minimum amount (€/£1) and then you can enjoy races. Please bear in mind that horse racing can also be viewed via a special service on the site. Paddy Power focuses on football and horse racing in the live streaming. As typical for most bookmakers live streaming has a small delay about 10 seconds behind real time. As an innovative bookie Paddy Power always wants to be better so you’ll like a superb multi-screen streaming and the size of the stream screen is bigger than its competitors. There is no doubt if you like live in-play betting Paddy Power is one of the best choices for you! Maximum winnings are important not only for big punters who place huge money for one bet, but also for ordinary gamblers who can win a big sum of money with a huge accumulator or a single bet with long odd. So you never know when you1`ll get lucky! And with maximum payouts Paddy Power is one of the best choices for you! The bookmaker provides equal limits to both single and multiple type bets, which will vary quite a bit depending on the event and market. Of course if we are talking about a multiple bet or an accumulator with more than one event, all of them will have different maximum payout limits, so for any bet other than a single bet, maximum payout will be equal to the lowest limit of one of the events. In any case Paddy Power is a good bookie for high rollers; beginners can also feel secure as a minimum bet is only ₤/€0.1. Please be aware that the minimum bet by phone is £/€ 5. Maximum bets and payouts are defined by sports and markets, but Paddy Power is always ready to accept high bets. Please note that maximum bet cannot be viewed in the bet slip, but if your current stake exceeds the limit you will receive the corresponding message. You can always contact the customer service in advance or find answers by searching in the “Terms and Conditions” section. The largest maximum payouts are for senior football competitions such as Champions and Europe Leagues, international matches, English Premier League, Championship, League 1 & 2, Scottish Premier, Bundesliga 1, Ligue 1 and La Liga: up to £/€1 000 000 for main markets (match betting, total goals, all types of handicaps, correct score and first goalscorer) and up to £/€100 000 for all other markets. As for other football leagues maximum payouts are massively lower: £/€50 000 for main markets and only £/€10 000 for all others. US sports have lower maximum payouts - £/€50 000 per match and handicap betting and £/€10 000 for all other markets (regular season of NBA, MLB, NHL). With regard to postseason matches maximum payouts will be two times higher. NFL has the largest limit up to £/€100 000. Other sports are close to the amount of these max limits. Maximum payouts for tennis match and set betting (Grand Slam, ATP or WTA) is up to £/€200 000 and £/€50 000 for other markets. £/€100 000 – 250 000 payout for major markets is available for other sports and non-sporting events. The maximum payout limit for horse racing is £/€100 000 for all races outside of the UK and Ireland and £/€1 000 000 for UK Classes 1 & 2. There is no doubt these limits are quite big and Paddy Power has proved once again its title of the best bookie in the betting industry. As one of the largest and most innovative company on the market Paddy Power was the first bookmaker to launch in the Apple App Store in the world! Since that an Irish bookie has become the top performer in the mobile betting. 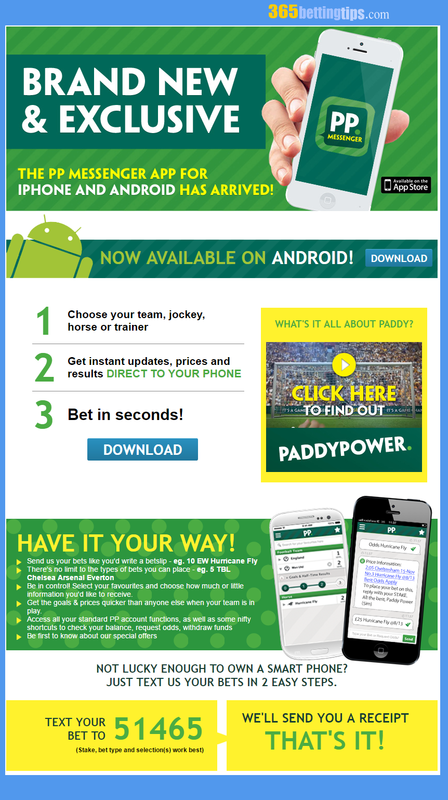 Paddy Power mobile apps would be the best choice if you like to bet on-the-go. All apps are available for Android and iOS operating system, BlackBerry, Nokia and desktop, which you can download from the bookmaker’s website or Google Play store. A mobile site is of course available for all customers. It’s a really perfect betting product, especially if you like green color!  All apps are fast, good designed, user friendly and easy to navigate so you can do everything you want – from placing a bet and bet in-play to managing your account and watching live streaming. All apps are identical so it doesn’t matter which one you will choose. 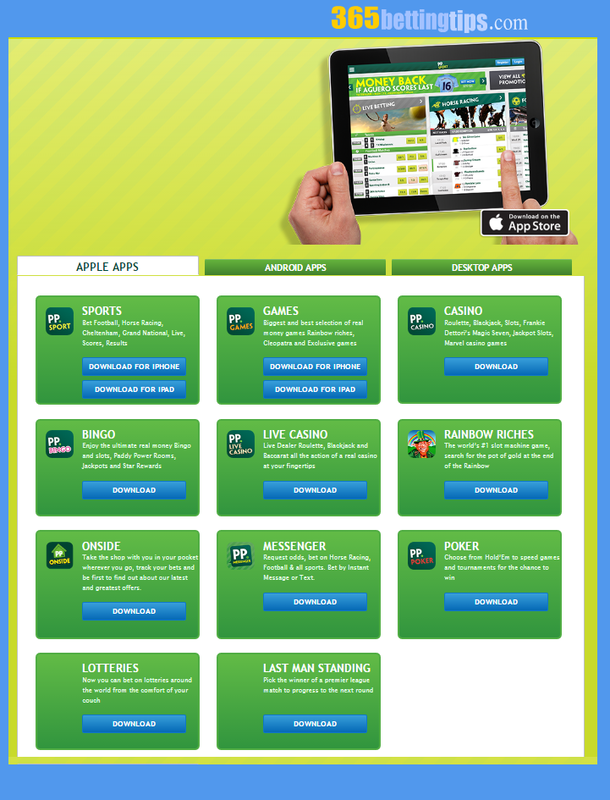 Paddy Power offers a range of mobile applications. Betting sports, Live Casino, Onside, and Poker are available for both Android and iOS operating system. Games, Casino, the world’s #1 slot machine game Rainbow Riches, lotteries and Last standing man are available only iOS. There are desktop apps: Casino, Virtuals, Poker and Financials. If you want to calculate your potential winnings the easiest way is to download the Bet Calculator. Just go to paddypowermobile.com and hit the jackpot! PP Messenger is a stand-alone app! Download this free app, log in using the same username you use for the main website and just place any bet via text messages. For example your text is ’50 D Liverpool Man City’, this means that you placed €50 on the double Liverpool and Man City to win. You can find Paddy Power’s keys and abbreviations in the Help section. Check these videos for the detailed information about PP Messenger - how to deposit and place a bet via text. The third largest online bookmaker in the UK, Paddy Power has been operating since 1988 and has an excellent reputation. An Irish company offers high standards services and is one of the most well established bookmakers in the globe. The company ranks among the safest bookies online. There is no information about punters who had serious problems with Paddy Power. All financial and personal data is highly protected and stored on a secure server protected by a network firewall. It’s hard to find a bookie which cares for its customers more than Paddy Power. It always pays out on all big winning bets, but can still limit a maximum bet amount if suspects that you are in group of customers acting together and placing bets containing the same selections. Paddy Power customer service is excellent and you can get a response from one of its support channels via e-mail, telephone, live chat or twitter within a matter of minutes. There is a comprehensive help section on the website which is very easy to navigate. First of all you must choose section (sports betting, casino, poker, games, etc. ), than find the top FAQs or use ‘advanced search’ typing keywords to find an answer. Besides, you can use ‘self service options’, just click on the category matching your query and get all necessary information. You can easily find the information you need in the help section. If you don’t find the necessary info in the Help section you can get support by phone. 24/7 phone helpline will solve your queries in a short amount of time. Paddy Power has fast response times: phone calls are answered within 20-30 seconds in average. Contact numbers are 00353 1 9050131 (International); 08000 565 275 (UK) and 1800 238 888 (IRE). As to support staff Paddy Power is maybe the best! Its answers are always efficiently! You will probably never find such well-mannered, knowledgeable, polite and friendly operators. Paddy Power provides customer support 24/7 through live chat in the 'Live Help' section. Live chat response time is about 30-50 seconds. It’s always quick and easy to get answers, but live chat support is available only in English. The customer support staff can also be reached via email: support@paddypower.com. The average response time before you get all answers is typically around three hours. Alternatively, there are Twitter pages for customers who are looking for help (@AskPaddyPower, @PaddyPower, @PPOffers). It’s another way to get a quick and clear answer. Finally you can write to the Customer service (Paddy Power Holdings Limited, 1st Floor, 12-14 Ridgeway Street, Douglas, Isle of Man, IM1 1EN). One of the biggest and most famous bookmakers Paddy Power offers a high quality services with a few drawbacks (live streaming is unavailable on a mobile device; EURO and GBP are the only accepted currencies). In all other respects Paddy Power is ranked among the top bookies. Its daily enhanced odds and money back specials are indeed amongst the best. Paddy Power’s extra features can be considered as one more benefit for players. Live streaming, horse racing form centre, blog, bet calculator is everything you would expect from such an outstanding bookie. Paddy Power is an excellent bookmaker providing massive betting limits, well developed payment section, well-mannered customer service and vast range of markets. No doubt an Irish company is one of the top five bookmakers worldwide! Log in and click on My Account. Click on Withdraw. Then, follow the specific instructions for your chosen method: Bank transfer. You will need to enter the country of your bank account from the drop down menu, your account number and sort code. Click on Update Bank Account Details. To set up the bank transfer as a withdrawal method, you will need to provide a copy of your bank statement and photo ID (passport or driver's licence), just the once. These documents are required for bank withdrawals to ensure customer security. You can send them to our security team via: E-mail: customersecurity@paddypower.com MMS Text: UK 88833 with the word PADDY included in the text box of the message; IRL 0833333250. Available On: Desktop only. Log in and click on My Account. Click on Withdraw. Then, follow the specific instructions for your chosen method: Neteller. You will be asked to enter the amount you wish to withdraw, leaving out the currency sign, and to confirm your password. Click on Make Withdrawal. You will receive a confirmation of your successful withdrawal and a display of your new balance. Available On: Desktop only. Log in and click on My Account. Click on Withdraw. Then, follow the specific instructions for your chosen method: PayPal. You will be asked to enter the amount you wish to withdraw, leaving out the currency sign, and to confirm your password. Click on Make Withdrawal. You will receive a confirmation of your successful withdrawal and a display of your new balance. Available On: Desktop only. Log in and click on My Account. Click on Withdraw. Then, follow the specific instructions for your chosen method: Skrill. You will be asked to enter the amount you wish to withdraw, leaving out the currency sign, and to confirm your password. Click on Make Withdrawal. You will receive a confirmation of your successful withdrawal and a display of your new balance. Available On: Desktop only. Log in and click on My Account. Click on Withdraw. Then, follow the specific instructions for your chosen method: Debit/Credit Card. You will be asked to confirm your debit card details and enter your Withdrawal Amount. You will also need to enter your account password. Click on Make a Withdrawal. Available On: Desktop, Mobile *Generally, withdrawals take 2-3 working days to reach your account. Please note that, due to bank processing times, withdrawals can take 5 working days to reach your account.